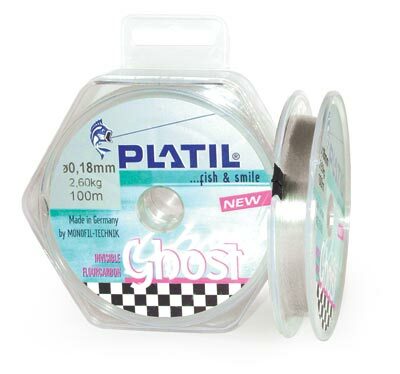 Platil Ghost Fluorocarbon. Discounts Apply ! Platil®’s new 100% Fluorocarbon Ghost line is almost invisible in the water because of it’s very high transparency and the light-breaking-factor with (1.42) nearly identical to this of water (1.33) ensuring more strikes. Platil® Ghost is a fast sinking line because it’s heavier than freshwater by 78%. It’s anti-waterabsorption surface coating gives the line greater durability and ensures longer casting distance. Made in Germany.